Posted by Jon in NECA, Toy Fair 2018, Video Games with 0 comments. Valve and Crash Bandicoot, there’s some odd bedfellows, no? I believe it is the year anniversary of us reporting on last year’s Toy Fair and NECA’s reveal that they would finish the cast of Team Fortress 2. Well, they didn’t end up doing it last year. However, it looks like things are kicking in now because not only did they have the last three Team Fortress 2 characters, but they had the missing BLU variants as well! 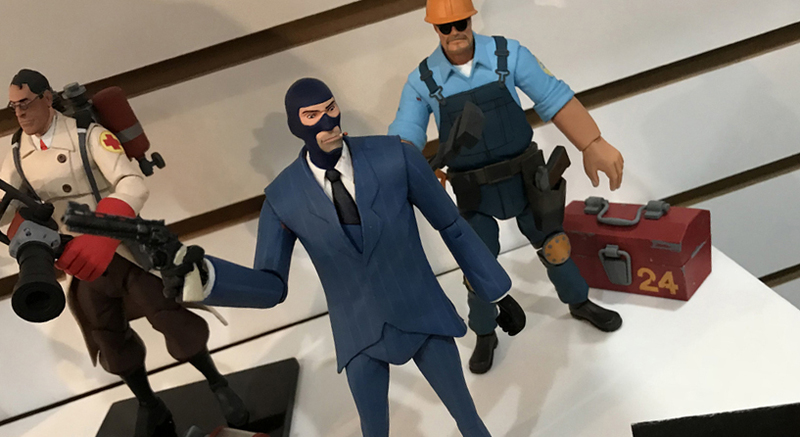 Come Q2 of 2018 we should get the BLU versions of the Spy and Engineer. Then in Q3 we’ll get the RED versions of the Medic, Sniper, and Scout. At that point we will finally have a company complete the entire Team Fortress 2 roster, and I can die happy. Since NECA is back working with Valve they will also be reissuing their Chell figure from Portal and Gordon Freeman action figure from Half-Life. Both of these figures have seen pretty high aftermarket values, so it’s great that they are giving us a second chance to own them. NECA also unveiled its Crash Bandicoot line! The first series should hit in Q2 2018 and include a standard Crash, as well as one with a jet-pack and flight gear. Q3 2018 will also see a Deluxe Crash release that comes with a hoverboard.